Is it just me that gets confused? What I can’t understand is standards, well what I mean is why do I need so many? Just take charging up your mobile phone they all look so different. Don’t worry I’ve been told there is a new standard based on micro USB or is it mini USB? I do pride myself on having reasonably modern phones and I can assure you the charging pods are all different. The reason for the annoyance, you know there is going to be one and that being that I took the wrong charger for my phone on holiday. They all look the same and the difference between mini and micro USB is for the electronics buffs amongst you. Why can’t I have colour coded plugs, blue for mini and red for micro, well that’s what my mother used to say about dresses anyway? Something about red for danger apparently. Now it doesn’t stop there because the joy carries on with memory cards, just about every device I have seems to have a different format for the memory card. It’s hard to believe there are so many, I really don’t know what they all are but my card reader boasts of being a 19 in 1 card reader, I’m not going to bother you with the names because I don’t think I could tell one from the other. All I know is that when I take the memory card out of the camera I go round each slot in the reader until I find one that it fits. It sounds horrendous but does anybody do anything different? Closer to home I have been totally bemused by mini and micro SIM cards. The other half impatient to the end clutching an iPhone 4 in one hand and an iPad in the other has entered the world of micro SIMs. Now we could all get bored about how many people ever used a full sized credit card for a phone SIM, I thought I was old enough but I certainly don’t remember them. 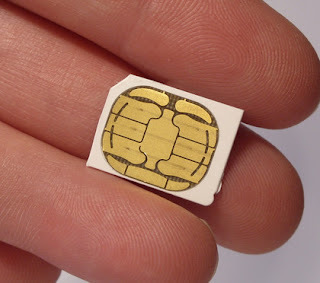 In fact a SIM card was a SIM card, who ever called them a mini SIM? But anyway we now have the micro SIM. And of course you can’t change it from phone to phone or iPad to phone and all the other combinations you can think of unless they are all the latest models from Apple. This may not be a problem you might think? Well the holiday was a technological extravaganza because the back fell off his iPhone 4. It looks like it never had the two bottom case screws inserted but according to O2 it’s now a write off as uneconomical to repair. Can you believe that, 2 miniature screws or micro screws or what have you and they’re more expensive to put in than the £430 O2 have demanded for a replacement phone? Apparently we’re off to Maplins this weekend to buy some of these screws for a DIY repair. I hope there aren’t too many standards involved here. I’d hate to think that two screws that look the same are totally different. Anyway the fun didn’t stop there, the Channel Islands (Jersey in our case) are interesting and recommended to all for a few days at least (I never realised the average rainfall is 16 days per month, it makes the UK seem positively dry) but the Island is devoid of Wi-Fi (except in St Helier but that’s a permanent traffic jam) you really are dependent on your mobile broadband. There was a good 3G signal all round the Island but that doesn’t help you when you can’t carry your phone around and apparently it’s difficult to stick it together with sticky tape when you’ve only got a touch screen. So here we are, buy a disposable phone and pop the SIM card in it. I can still remember the look on the guys face in the mobile phone shop (only in St Helier of course) when he looked at the micro SIM, you would have thought it could only have come from Dr Who’s Tardis. So you can’t easily buy mobile phones that use a micro SIM and surprise number 2 was that if you have a UK pay as you go SIM you can’t have cellular data in the Channel Islands. Apparently the islands are foreign territory although Wikipedia thinks they are a Crown protectorate. Apparently the only way you can have cellular data in foreign lands and the Channel Islands is to have a contract SIM – just make sure it’s not a micro SIM unless you have a spare phone with a micro SIM socket. Perhaps we could have adaptors, a 19 in 1 do everything – just joking. Don’t forget, Paris strikes permitting that Cartes 2010 is just around the corner for 7th to 9th of December.